I t was beautiful but can't help to silently ask when it will end. We were passing on, with respect to the total overall length, the longest overwater highway bridge in the world, the Lake Pontchartrain Causeway across Lake Pontchartrain, it connects Metairie with Jefferson Parish on the South Shore and St. Tammany Parish on the North Shore. The northbound span extends 23.87 miles and the southbound 23.86 miles. An Engineering masterpiece. 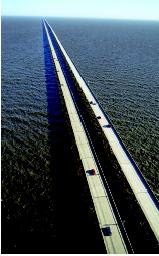 An aerial view shows the parallel roadways of the Lake Ponchartrain Causeway in New Orleans, Louisiana. It is the world's longest road bridge. Until now we can still see traces and remnants of the great hurricane Katrina. The swamps are so vast and the trees that were once standing high in there are now barely standing half if there are any left. But the good thing is that I saw some signs of recovery, at least.